Update: the cover of Nature’s Best Photography Spring/Summer 2010 issue came from this shot. OK, I admit it, this post is really just an excuse to share a photo of myself. I get so few photos of me that when I receive one I like, its a big deal. Patrick Endres made this photograph. 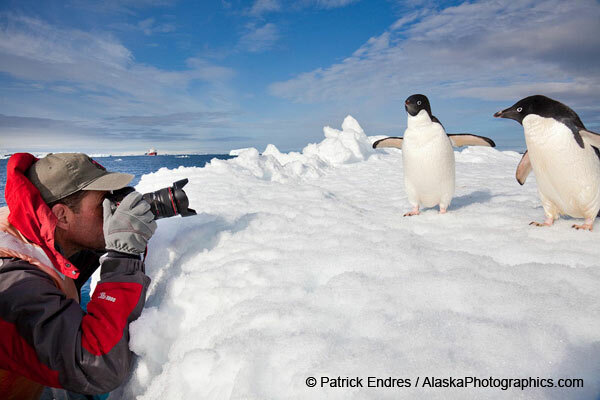 Patrick, a full-time professional stock photographer and guide and tour leader from Fairbanks, Alaska, was on staff for my recent Cheesemans Antarctica trip. He, along with fellow pro and staff member Hugh Rose, had a few of us out zodiac cruising at Paulet Island in the northern reaches of the Antarctic Peninsula. We were sidled up beside a low, flat ice berg with some Adelie penguins on it when three of the penguins walked across the berg to us and looked at us curiously, as if they wanted to hop into our boat. We scrambled for the widest lenses we had (even 70-200 was too much, the penguins were so close) and snapped off a few photos. It wasn’t the photos but the sponteneity of the moment and the naive inquisitiveness of the Adelies that really made our face-to-face meeting with these little guys special. All of us were laughing and enjoying the moment. Another couple zodiacs came over and had the three Adelies look them over as well. You can see the icebreaker ship M/V Polar Star that was our home for a month, in the background of this photo. That was about two weeks ago. I wish I was still there among the birds and ice. Patrick sent me this photo last night. I love it, it brings back that wonderful afternoon. Patrick Endres has a great blog, be sure to check it out since he is currently sharing some of his experiences from the Falklands, South Georgia Island and Antarctica. I really do owe Patrick and Hugh and the rest of the Cheeseman’s staff a big “thank you” This is a staff that has the experience in the field, particularly in the Southern Ocean, that enables them to find great wildlife watching and photo experiences for their guests. They worked hard in all kinds of weather and sea conditions to make such experiences happen frequently.